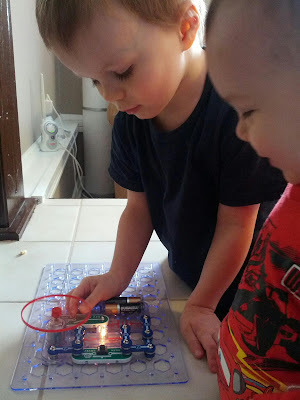 J and K built a two speed fan with a light. 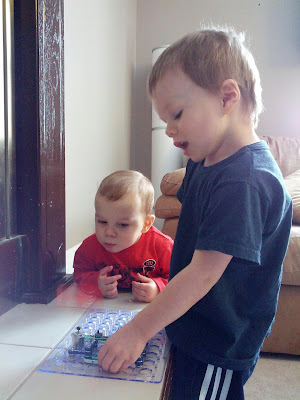 The boys each received a gift card to Indigo from their uncle for Christmas. Of course, I stocked up on cheap Christmas books, but I spent many hours browsing their website for something new. Something different. That's when I stumbled upon Snap Circuits Jr. and I knew it was perfect. 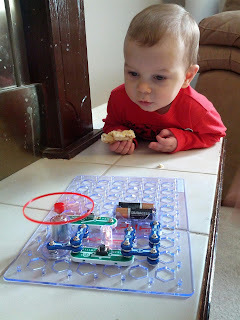 Snap Circuits Jr. is a super cool and fun way for kids to learn about the electronic devices around them. It's recommended for age 8+, but I generally disregard most age recommendations on toy boxes since I know I will be supervising them anyway. Basically, you build a project (there are 101 to chose from) following the color coded instructions, using a variety of different pieces that just snap together. Then when you turn the switch on, electricity flows through the snaps on the pieces to create sound effects, a flying saucer, turn on a light, and so much more. It looked like so much fun. 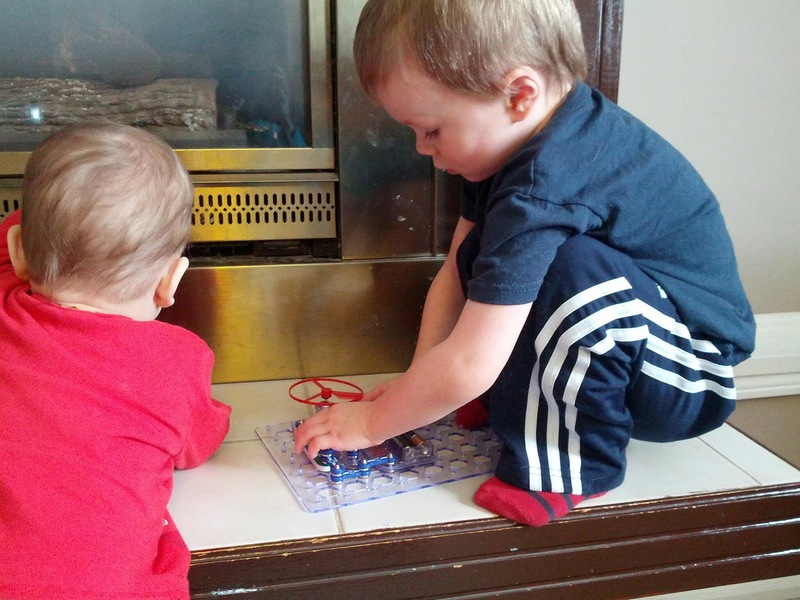 I knew the boys would love it and, I must admit, I was dying to try it out too! 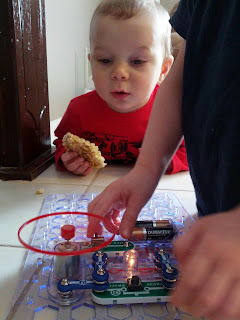 Just days after ordering it, I noticed that one of my favorite blogs, Play at Home Mom, posted a picture on Facebook of their preschooler playing with Snap Circuits too. Now, I was even more excited. Originally I was going to reserve this toy for alone time with J (when K would be napping). However, K definitely found it interesting to watch what happened when the power was turned on. 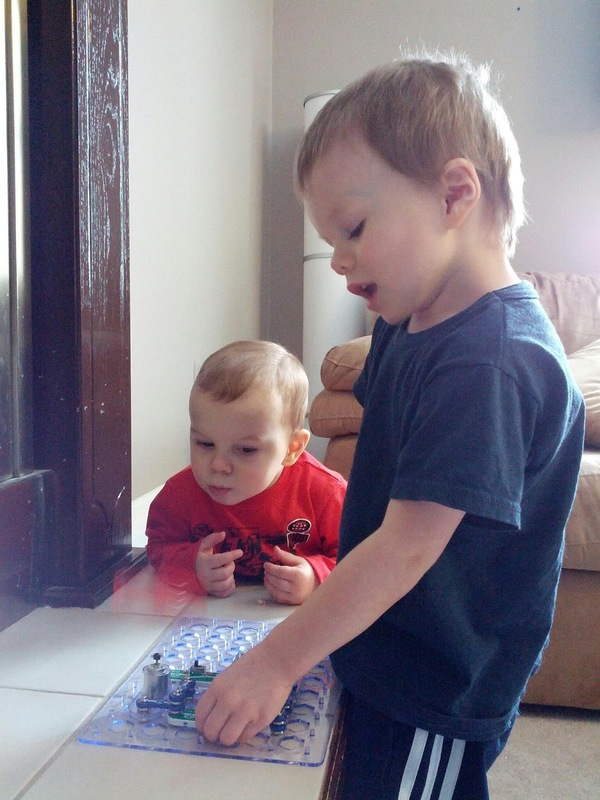 He also enjoyed pressing the switch button whenever J would let him have a turn. K looks interested in what is going on. I think that Snap Circuits Jr. is absolutely wonderful. It is easy to use and has a wide range of interesting projects to make. The pieces are all clearly labeled and color coded, which makes interpreting the instructions that much easier. The instruction book also provides a nice summary for each project that describes an aspect of how electricity works, such as what a photoreceptor is or how a fuse works. It only requires the use of two AA batteries. Plus, the price point was quite reasonable. It was only $30 at Indigo (you can check it out here). The only downside I can think of is that the sounds are annoying, but I am thinking that has more to do with the fact that J likes to leave the alarms sounding FOREVER. My only regret is that I didn't purchase one of the bigger sets, but that's OK since, at the moment, J seems to only want to build Project #13/14 (Two-Speed Fan/The Fuse) and Project #10 (Space War Alarm Combo) repeatedly. 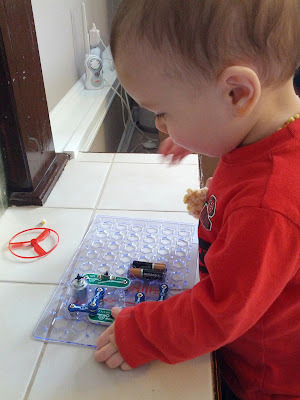 J turned on a light! K's turn to press the buttons. 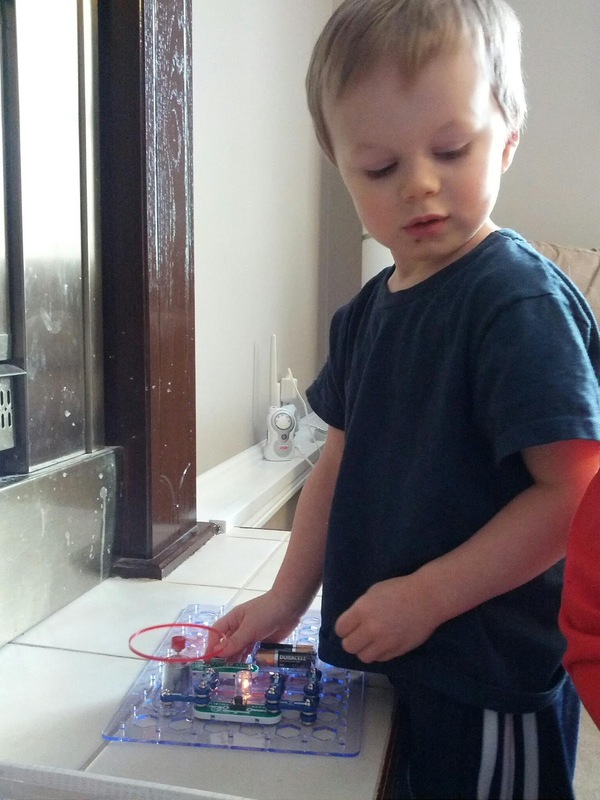 J created a flying saucer (note the red blur).